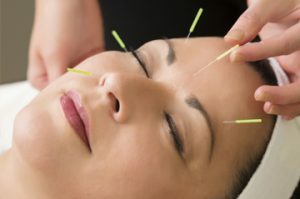 By applying acupuncture to certain points along various meridians of the body, the body's equilibrium can be re-established, treating the cause and the pain of a migraine. Acupuncture has been shown to be effective in treating migraine headaches. The exact mechanism of action is not known. One theory suggests that acupuncture releases endorphins, the brain's natural painkillers. Another states that acupuncture may stabilize levels of serotonin, a chemical messenger in the brain. Research has shown that after acupuncture treatments, patients experience fewer and less-severe migraine attacks. Acupuncture is often coupled with Chinese herbs, changes in diet and lifestyle, vitamin supplements and other measures. By applying acupuncture to certain points along various meridians of the body, the body's equilibrium can be re-established, treating the cause and the pain of a migraine. By the time most migraine sufferers discover acupuncture, many have often suffered numerous previous attacks and have been on a long, exhausting search for relief. Although acupuncture can successfully ease the pain of an attack, therapy is best used as a preventive treatment for migraines. Before treating with acupuncture, the pain's source must be determined. Because the head is traversed by many meridians, the location of a headache determines which meridians are involved. For example, pain in the occiput and nape of the neck indicates blockage of one meridian, while pain at the forehead and above the eyes indicates problems in a different meridian. Pain by the temples and side of the head is related to yet another meridian, while pain at the top of the head indicates an imbalance in yet another. Each of these headaches is relieved by applying acupuncture to different points, depending on the location of the pain and the meridian involved. The acupuncturist will also want to know what the pain is like if it is associated with particular weather patterns or food intake. For example, not all, but a small proportion of migraine patients will react to tyramine, a chemical found in aged cheese, yogurt, beer, wine, liver, yeast and certain other foods. The time of day when a headache occurs is another factor to consider. After determining these factors, a treatment program can be designed to restore the proper energies to normal and prevent recurrence.